The homescreen separates your calculations into different groups making it easy to find the ones you are looking for. The leg calculator is a great example of a user's request coming to fruition. 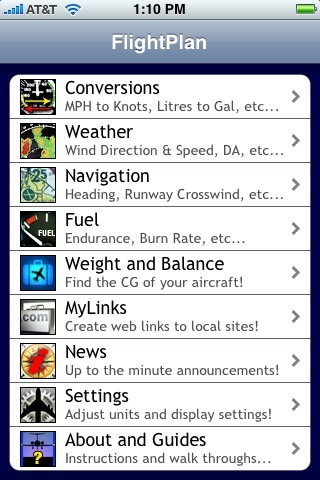 A CFI requested this feature because he had to check many student's flight plan calculations which was a tedious task. Now, he simply enters the numbers above and all of the answers are shown at one time! No more calculating each value separately! The Windstar is a neat little tool! 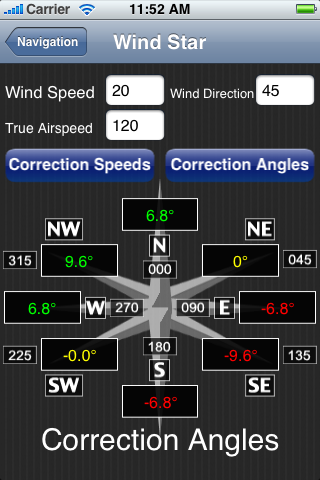 Enter your airspeed and wind characteristics, then at a glance you can see what correction angle you will need to have a course along each point of the 8 direction star. 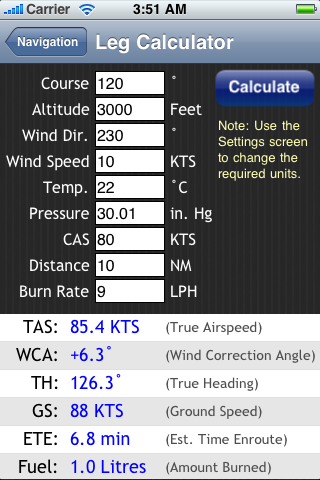 You can also see what your airspeed will be in each direction as well. This is the simple template screen for W&B calculations. 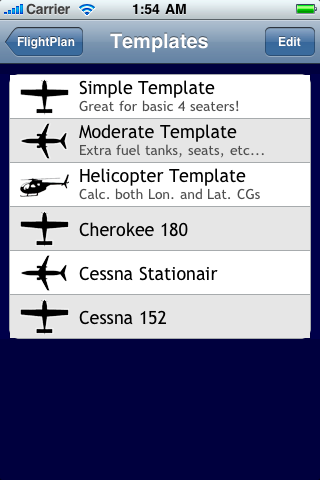 This template is streamlined for 4-seater aircraft that do not need any customization. Just enter the numbers and see your full and zero weight CGs. 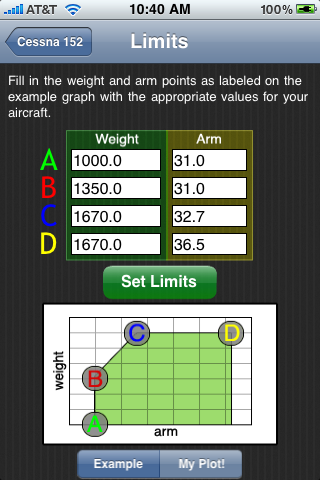 The new Limits screen for Weight and Balance templates allow you to specify the envelope for your aircraft. The calculation screen will let you know when you fall outside your envelope by showing your values in red. 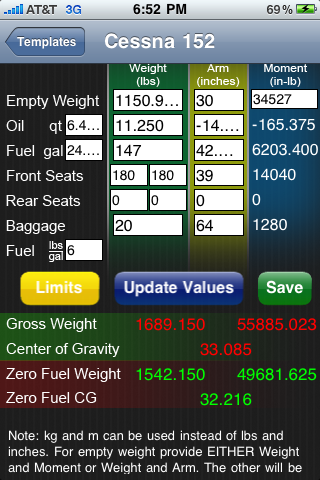 A new addition to the Weight & Balance system in FlightPlan is the ability to plot your envelop and CGs for both full and empty fuel. This is the moderate template screen for W&B calculations. This template is designed for customization, allowing extra passengers, fuel tanks, baggage compartments, etc. to be added. This template behaves similar to the Moderate template except this one allows for calculating the Center of Gravity on both the longitudinal and latitudinal planes. 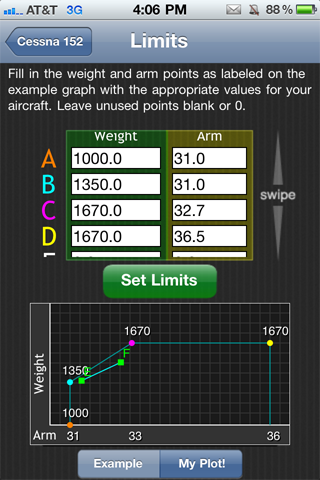 Some features in FlightPlan allow you to save what you do for easy access later, such as Weight and Balance templates, weather and airport data lookups, etc. 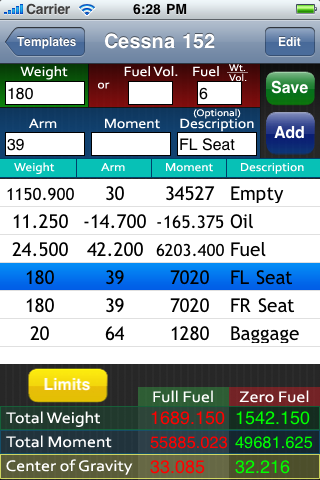 This screen shows how the Weight and Balance menu may look with your saved templates available. 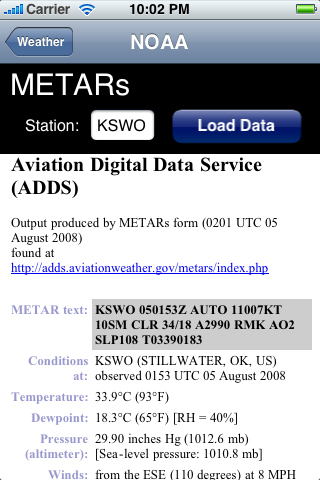 FlightPlan is capable of grabbing METAR data for many airports. 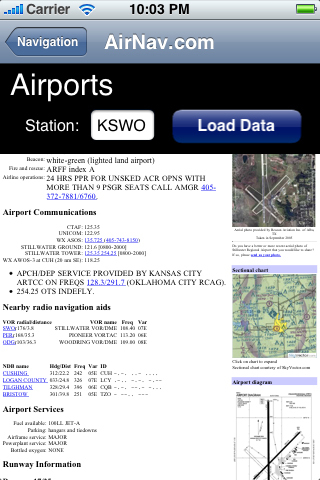 You can choose to either have FlightPlan show you the raw data or a nicely formatted view (shown). 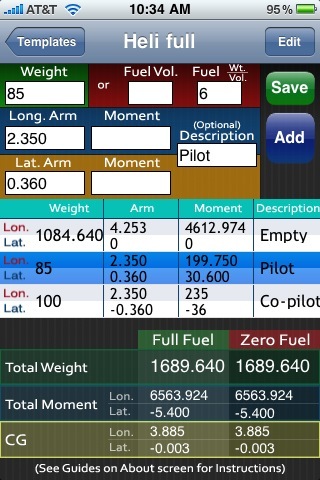 This screen shows a typical calculation screen in FlightPlan. It is very functional and gets the job done. Feel free to contact the developer on the Community Forums or by using the Contact link below.